Rebecca is an asset to faculty, students and staff and often makes contributions in areas above and beyond the responsibilities of her job. When interacting with members of the Widener community, she demonstrates a high level of commitment to service, teamwork, dependability, initiative, and reliability. Rebecca has provided exemplary service to Widener Law for 18 years and is always friendly and respectful and helps creates a positive atmosphere. 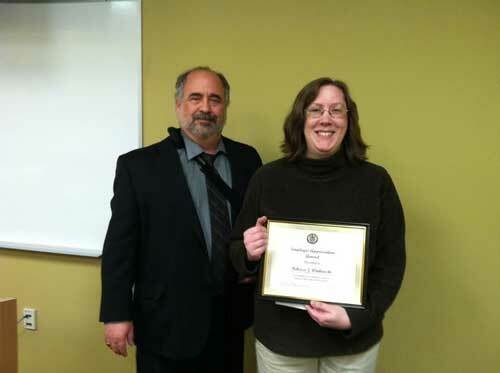 Picture: Assistant Dean Anthony Doyle presents the Employee Appreciation Award to Rebecca Winkowski.